In this video, This Old House landscape contractor Roger Cook explains how to mow a lawn. 1. Measure cutting height of mower, and adjust, if necessary, to 3 inches. 2. Check oil and gas levels of mower. 3. Mow in straight lines back and forth across the lawn; overlap each pass. 4. Make a pass along fences and property lines to cut any remaining grass. 5. 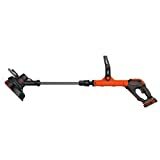 Use string trimmer to cut grass along flowerbeds and under fences.